Make at least 2 cups at a time to assure best flavor. When making consecutive pots of coffee, always rinse out appliance with cold water. Making coffee in a warm unit may result in weak coffee. For perfect taste of the drink every time, always fill your appliance with fresh, COLD water. Fill to desired level (see fill level indicator inside the body on the handle side of the unit). The numbers indicate the quantity of cups brewed. For best clarity and flavor, use one of the disposable wraparound filters included. These filters can be found in the top filler of the carton. Additional filters are available at grocery stores and online. Place the center hole of the filter over the basket stem (Fig. B). Cover the basket with the basket lid. Place the perk tube in the appliance perk well. (The perk well is the indented portion in the center of the coffee maker base.) While holding the tube in place, slip the filled basket onto the perk tube. 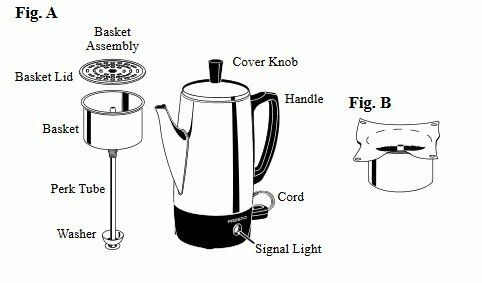 If the perk tube is not seated properly in the perk well, the percolator will not make hot drink or coffee will be weak. Place the cover on the device and push it down firmly. Connect the cord to the coffee maker and then to a standard 120VAC wall outlet. Never plug device in without water or liquid coffee in it. The signal light comes on automatically when drink is ready. CAUTION! Use proper precautions to prevent the risk of burns. Do not touch the device’s hot surfaces. The drink stays hot as long as appliance is plugged in. Disconnect the cord from the electrical outlet first and then from the appliance.CAUTION! Allow to cool before washing the unit. Unplug cord from electrical outlet and then remove from coffee maker. Hold onto the coffee maker handle with one hand. Position your other hand so that the heel is resting on the cover on the spout side of the device and your fingers are grasping the cover knob. Pressing down with the heel of your hand, tilt the cover towards the spout side of the device. Pull the cover off. Discard coffee grounds and filter. Wash and rinse inside of device, cover, and basket assembly with warm, soapy water after each use. The perk tube, including the washer, and spout can be cleaned with a brush. Important: Do not immerse coffee maker in water or other liquid or allow the plug receptacle or base to get wet. Wipe outside surface with a damp cloth. Thoroughly dry with a towel. Keep the plug receptacle area dry. If you notice any moisture, dry thoroughly before use. 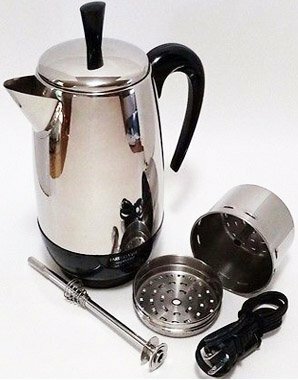 To keep the percolator functioning properly, periodically remove oil, stains, and any sediment from inside the percolator with a percolator cleaner, available at most hardware and discount stores. Periodically check the washer on the end of the perk tube to make sure it moves freely. If the washer is stuck to the end of the perk tube, clean it with a brush. Fill the water reservoir with a solution of equal parts of water and regular white household vinegar. Run it. When the cycle is finished, turn off your device but allow the water/vinegar to sit in the carafe for a few minutes. You should run clear water (no vinegar) through your coffee pot at least twice, allowing it to cool down between cycles. 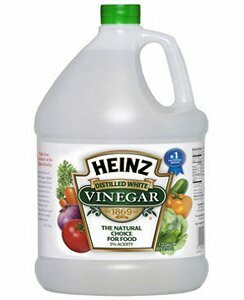 This will remove any lingering vinegar residue.